Yesterday saw a subscribers-only early access sale on mattycollector.com. You could buy that super-secret Hordak variant, or… Stinkor. Both sold out, and there has been a lot of anger and hurt feelings, but that’s not my department! So, Stinkor was up for sale yesterday. if you missed the sale, you might be considering buying him today. So… hey, guess what? Even though this guy came out about a year ago, it’s definitely not a “retro” review! Stinkor is one of Skeletor’s henchmen, and there’s really no way to treat him with dignity. In the original toy line, he was Mer-Man painted like a skunk, wearing Mekaneck’s armor, and treated with patchouli oil. He never got to appear in the cartoon because the writers couldn’t fathom how to write him without making it a fart joke, the poor guy. Fast-forward almost twenty years later to the 2000s-era cartoon, and Stinkor suddenly got an origin story, several episodes dedicated to him, and… no figure! Though he did get one of those weird not-statues later on. Right. 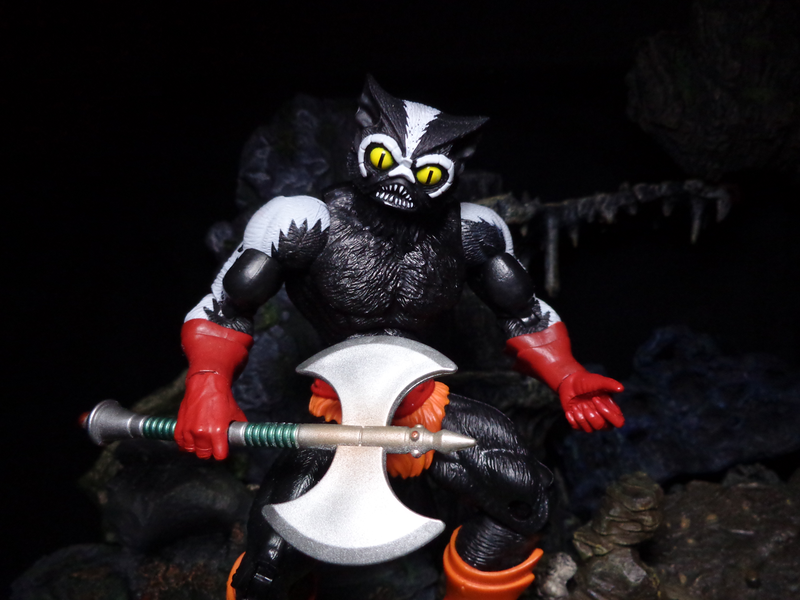 The newest Stinkor figure kind of combines both aesthetics. It’s mostly Vintage, but gives you a few 200X options, like his breathing mask, tanks, or the little valve on the front of his armor. His release was surprisingly controversial for reasons I’ll get into later, but… well, hey! It’s Stinkor! Sorry about the slapdash nature of some of these photos (like the lack of a packaging picture) – I wasn’t aware that I would be writing a review of this guy until very recently. So instead of photos meant to show off every single detail of the figure, you’ll get some just meant to help it look good, hopefully. Same MOTUC packaging as always. Box, another box, final box. You’ve heard it before, you’ll hear it again. And heeeere we go! I personally love Stinkor, but there are a few… issues that bothered a lot of people and need to be addressed. So, let’s start with the basics, move to the positives, and then look at any problems! 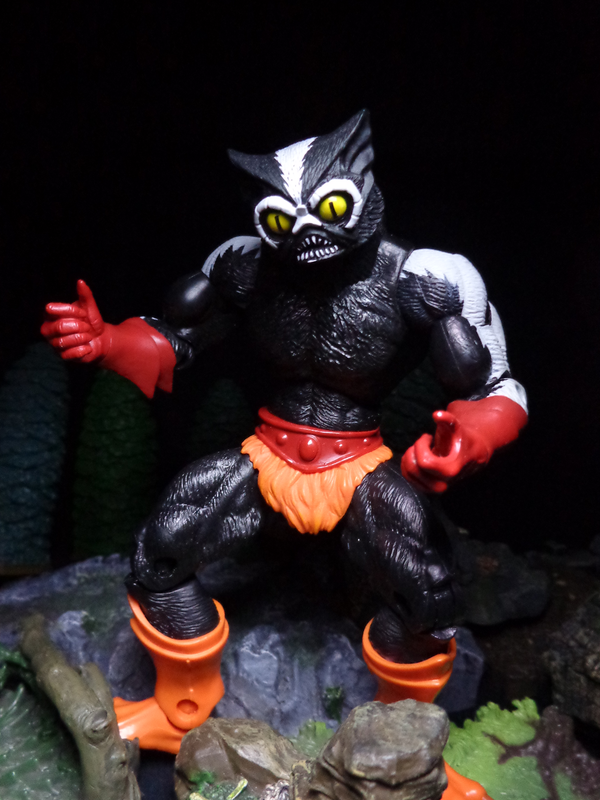 Firstly, Stinkor is mostly made up of reused parts – he has Beast-Man’s body and thighs, Skeletor’s shins and feet, one of his heads is recycled from Mer-Man, his armor was intended for Mekaneck (Stinkor got it first, but it’s clearly Mecky’s), and forearms that are a slight modification of Skeletor’s. You really have to rely on his paint for this figure to be unique, which is something that will be covered in the next category. Just realize that Stinkor doesn’t exactly have a lot of new tooling. 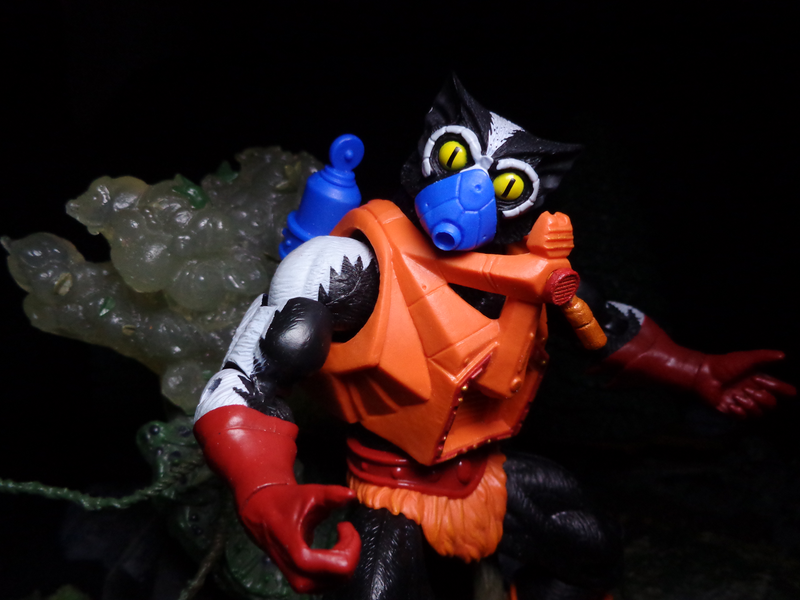 Despite all the reuse, Stinkor doesn’t look like he’s been randomly cobbled together, which is one of the big pluses of this line – everything’s modular! It also helps that eveybody seems to have those Skeletor boots, and his Mer-Man-repaint head looks more like a mammal than a fish. Stinkor’s new head is very similar to the other one, but differs more than enough to be its own thing. It resembles his 200X appearance, but not entirely, and really is its own unique thing. There has been some criticism because it’s so similar to the other head, but really, this piece is needed to make the figure a little more unique. When you place the heads side-by-side, you can see the differences a little more, especially in the eyes. It’s an odd little juxtaposition between MOTUC’s slavish devotion to vintage designs, and the sheer necessity of innovation – these toys have to offer SOMETHING new. The main problem with Stinkor, which alone takes off an entire star, is the issue with his forearms – they’re reversed. Or they’re not reversed. He has a modified version of Skeletor’s forearms with fur sculpted over the skin. The glove spikes point the wrong way, and if you really look closely, you can see that his musculature doesn’t line up right. Swapped parts is kind of a chronic issue in this toy line, with everybody from Roboto to King Hsss to Frosto falling victim. 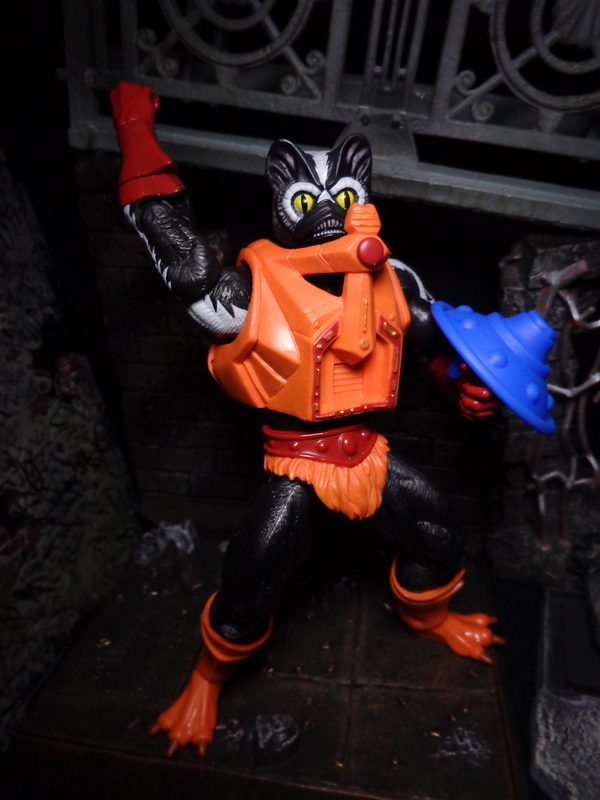 But the thing is, Mattel usually admits when parts got swapped – with Stinkor, they said that it was an intentional move made during production to try to make him seem more unique. This… makes sense, kind of, since he’s made up of so many reused parts. Since they had already resculpted the forearm pieces a little bit, perhaps it would have made more sense to swap the musculature around, but keep the glove spikes pointing inward. It doesn’t really bother me personally, but a lot of people were sore – and it’s hard to swap, because you will have to repaint the pieces as well as switch the arms around. Now, despite everything, Stinkor worked out pretty well. His various parts fit together, the arm issue isn’t noticeable unless you look closely, and he looks good both geared up and stripped down – take off his armor, and he’s a savage skunk man! Despite the individual issues, the whole package is quite nice, which is probably why he sold out so quickly. Since Stinkor is made up of nearly all reused parts, his paint is really important. How those pieces are colored will determine whether he looks unique or like a cheap bootleg. 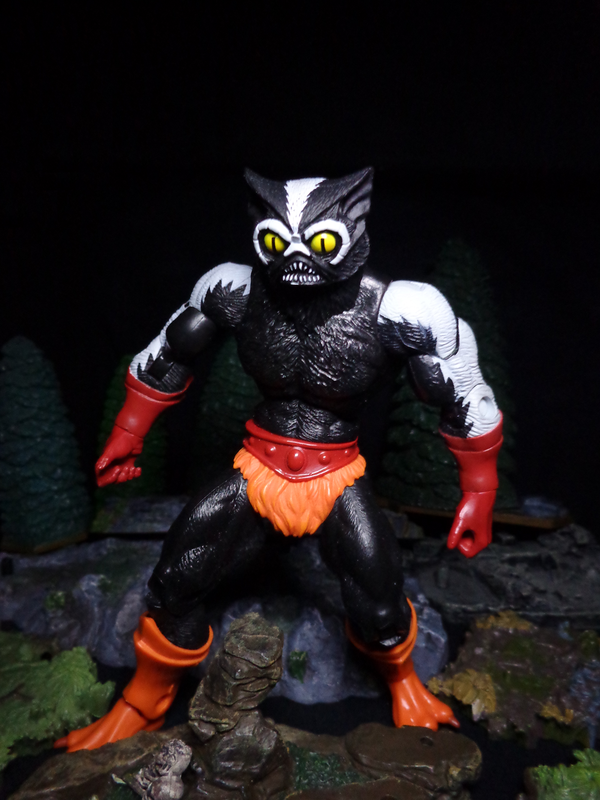 Stinkor’s vintage figure survived being a Mer-Man repaint partly because of this… and also because Mer-Man’s vintage head looked like a cat. 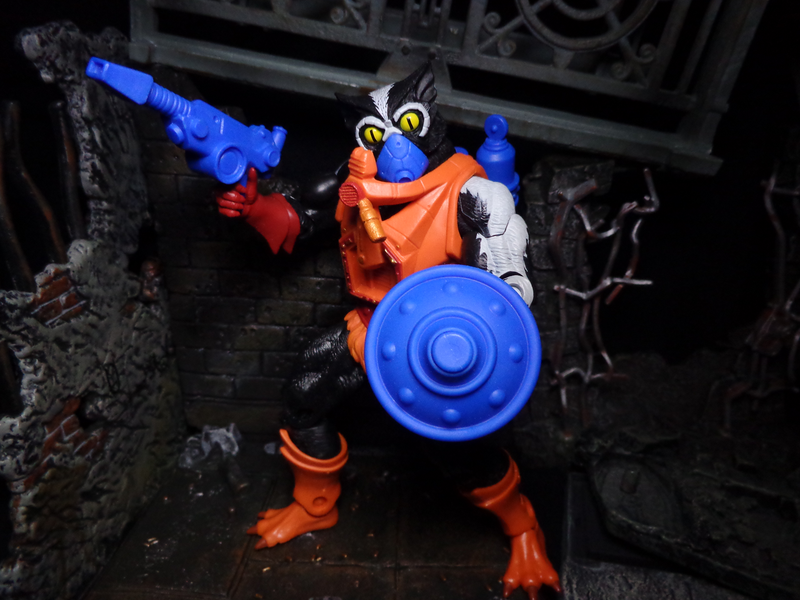 Stinkor’s color scheme is bootstrapped to his vintage design – a black body with white stripes, yellow eyes, orange and red armor, and blue accessories. With that in mind, the paint is excellent. His stripes are crisp and line up decently well, his eyes and teeth are good with no slop, and his armor has enough red to offset the orange. Just as with the vintage figure, his Mer-Man head looks like a unique thing, not just a repaint… though it is, and you really have no reason not to use his similar-but-distinct new head. But if you want to emulate his vintage design, you’re in good hands. Stinkor’s got standard articulation for this line. Which I’ve said before… but hey, it’s good and servicable. His armor does get in the way of his arm movement, but that’s no different than any other heavily-clothed figure in the line. 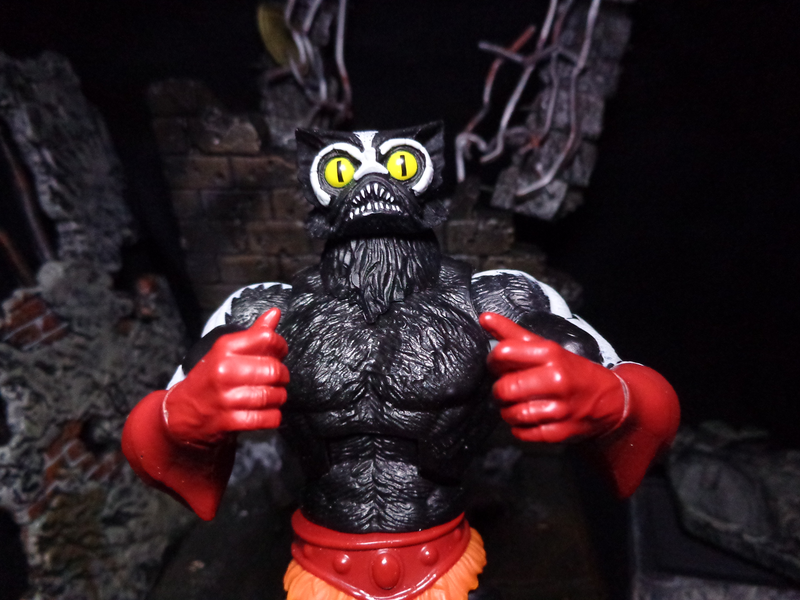 No complaints on my end – Stinkor can take any pose I really want to put him in. And heeeeeere we go again! On paper, Stinkor’s accessories are awesome! He’s got his armor, shield, gas tank, breathing mask, gun, and two swappable accessories for the front of the armor. Problem is, the prototype showed a different paint scheme for most of his accessories – blue with metallic highlights – and we got flat blue. Honestly, it’s probably a necessary budget issue, as Stinkor was clearly designed to save money to be used on other figures, like Draego-Man. As with the forearms, I can stand it without a problem, but it really rubbed a few people the wrong way. Stinkor’s armor is fantastic, and it later showed up again on Mekaneck. It’s somewhat hard to take on or off, but that’s normal for this line. You can swap the valve in front with a little red dot to match his vintage look, though I prefer the valve. Both accessories are tiny, and easy to lose, so keep track of them! Stinkor’s breathing mask fits on his new head – it’s a little loose, but his armor will actually keep it clamped on, so no worried. Just be careful not to scrape the paint on his face! His gun looks like it fires some gas from a reserve tank, but it also seems like it should have a hose or something connecting it to the main tanks – c’est la vie, I suppose. The tanks are just fine, and plug securely into his back. The shield is pretty basic, but matches up perfectly with his vintage design, and is better than some other shields we’ve gotten, so no complaints there. If not for the flat blue pieces, Stinkor would have gotten a really, really good score here – it’s just that color issue that knocked off a star. What’s this? An ACTION FEATURE?!?!? Yeah, sort of. The original Stinkor had patchouli oil mixed in with his plastic, and so does his new toy! It’s not very strong, apparently onloy having been mixed in with the back half of his torso, but it’s pretty present, and if you handle Stinkor you will smell that sickly-sweet, cloying, musty stench. Since it’s mixed in and not sprayed on, it’s not gonna go anywhere. If you want it to get stronger, try keeping Stinkor in a ziploc bag for a little while to really let him stew – it’s worth it! As a side note, I recently had a lot of repairs done in my house, and part of it involved letting the pipes sit dry without any water running through them. When you do that, they begin to stink – rotting foodstuffs, dried sewage, and whatever else you had will just sit and fester without being washed through. Stinkor helped me survive the ordeal by smelling like a hippy spice shop and masking the dry pipe stench just enough to be livable. Thanks, Stinkor! If you bought him yesterday on the Matty sale, you would have paid nearly $40 for this guy after shipping and taxes took their part. But since that’s not gonna happen, you can expect to pay $60 o $70 on the secondary market for him! I’ve joked about MOTUC prices. I’ve complained about MOTUC prices. I’ve… bah, it’s not worth it anymore. Look, these things are already overpriced. It’s even worse now. 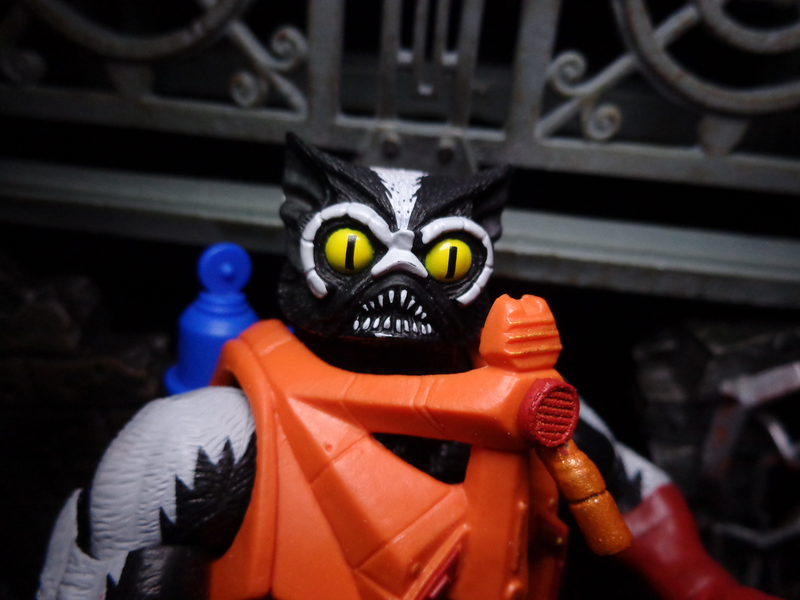 My Stinkor should be happy that he played a practical role, because… Gah! I can’t even ARTICULATE how bad $70 is for such a basic action figure! Sometimes Stinkor’s face paint can get scraped by his mask, and you should pay attention to his stench – try the ziploc bag trick I mentioned. It’s also a nice way to keep his tinier accessories safe. Yeah, I have to give Stinkor a high score. Despite the swapped forearms, massive parts re-use, and flat accesories, he’s just… he’s fun. The pieces work well together, he looks great with or without armor, and he’s a nice tribute to one of the strangest, silliest characters in He-Man history. I mean, seriously… Stinkor? Really? This concept got approved and designed back in the ’80s? Okay, then! Besides, he saved my sanity. That’s got to count for something!